AEC Engines of the Post-war Years. This Information Sheet was produced in response to questions raised by contributors to our Noticeboard. It relates only to those engines which were produced from the early 1950's until the factory's closure in 1979. 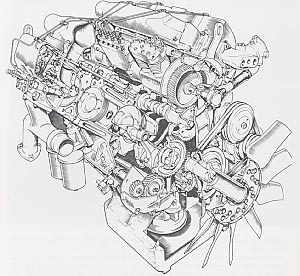 Apart from there being Vertical (AV) and Horizontal (AH) versions of AEC's 6-cylinder in-line engines, there were many variants of these types, providing alternative power outputs; different maximum speeds; alternative fan types; alternative sumps; alternative fuel pumps, electrical equipment, etc. A V8 series of 8-cylinder vee-engines, as per the illustration, was also available in the latter years. Besides Standard engines, there were a number of Standard Variations advertised by the Company. AEC's Sales policy was always to build to Customer Sales Orders, which could result in combinations of these Standard Variations to suit a particular customer's requirements. This Sales policy wasn't confined to engines, but covered the complete Chassis builds. There were also changes brought about by AEC's programme of continual design development. AEC Engines were not only built for use in their own Goods and Passenger chassis, but as Stationary Units, Railcar Units, Marine Units, and for use by other commercial vehicle builders. The 6-cylinder in-line units were based around two main engine blocks. As bore diameters and outputs for each of these types increased, so their mounted auxiliary equipment also increased in size, so that, eg., an AV760 engine would not easily replace an AV690. The V8 units were 8-cylinder, 90-degree-Vee units. Engine Type (Vertical/Horizontal) ... Bore/Stroke(mm) ... Capacity(ltr) ... Power Output(bhp) ... Features. AV/AH410 ... 105/130 ... 6.7 ... 80-128 ... wet liner. AV/AH470 ... 112/130 ... 7.7 ... 90-144 ... wet liner. AV/AH471 ... 112/130 ... 7.7 ... 115-135 ... dry liner. AV/AH505 ... 116/130 ... 8.2 ... 135-182 ... dry liner. AV/AH506 ... 116/130 ... 8.2 ... 130-150 ... dry liner, high-lift valve. (AV/AH515 ... 116/130 ... 8.2 ... unknown ... dry liner, high-lift valve, turbocharged ... being developed in 1973, but never introduced). AV/AH590 ... 120/142 ... 9.6 ... 125-159 ... wet liner. AV/AH690 ... 130/142 ... 11.3 ... 150-192 ... wet liner. AVT/AHT690 ... 130-142 ... 11.3 ... 220-250 ... wet liner, turbo-charged. AV/AH691 ... 130/142 ... 11.3 ... 180-206 ... dry liner. AV/AH760 ... 136/142 ... 12.4 ... 160-265 ... dry liner. L12 ... 136/142 ... 12.4 ... 210-230 ... dry liner, high-lift valve. TL12 (AV770) ... 136/142 ... 12.4 ... 265-280 ... dry liner, high-lift valve, cooled-pistons, turbo-charged. V8-800(AV8-740) ..... 130/114 ..... 12.1 ..... 225-247 ..... dry liner. V8-801 ..... 135/114 ..... 13.1 ..... 240-275 ..... dry liner. (V8-810 ..... 135/114 ..... 13.1 ..... 352 ..... dry liner, high-lift valve, turbo-charged ..... being developed in 1973, but never introduced). AV/AH1100 ... 156/156 ... 17.9 ... 175-300 ... wet liner. AVT/AHT1100 ... 156/156 ... 17.9 ... 300-400 ... wet liner, turbo-charged. A410 & A470, 1953; AV471 and A505, 1964; A506, 1976. A590 & A690, 1958; A691 & A760, 1965; L12 & TL12, 1973. V8-800 (A740), 1968; V8-801, 1970?. A505 until 1977; A506, A760, L12 and TL12 until 1979, although TL12 continued to be fitted to the Leyland Roadtrain until 1983. There are members of the Society who are better qualified than I to verify all the above and I hope that they will draw my attention to any errors. Graham Edge's book "AEC Lorries in the Post-War Years", is very informative concerning AEC power units over this period, as is Alan Townsin's "Blue Triangle - a Look at AEC Buses". Graham Edge's books "The AEC V8 Diesel Engine" and "AEC Mandator V8", give in-depth coverage of the development and use of this last of the AEC family of engines. Graham Edge's publications are available via his address on our Contacts page. Alan Townsin's publications are available via Venture Publications Ltd, PO Box 17, Glossop, Derbyshire, SK13FA, England. For a brief history of the AEC and its products refer to "80 Years of AEC" by Alan Townsin and Brian Goulding, published in 1992 by Senior Publications of Glossop, Derbyshire, England. For a fuller account of the rise and fall of the AEC and with particular regard to its passenger chassis design, development and production, refer to "Blue Triangle...a look at AEC buses" by Alan Townsin and published in 1994 by Venture Publications Ltd., PO Box 17, Glossop, Derbyshire, SK13 9FA, England. Similarly, a full account of AEC's fortunes and mis-fortunes with regard to its post-war engines and goods chassis, can be found in Graham Edge's "AEC Lorries in the Post-war Years", published in 1994 and available from Roundoak Publishing, Nynehead, Wellington, Somerset, TA21 0BX, England. A complete account of AEC's history is to be found in Alan Townsin's book "AEC", published in 1998 by Ian Allan Publishing in their Ian Allan Transport Library series.